Luxury 6 bedroom, 5 bath home sleeps 16 with gorgeous lake views and a hot tub. Property Size 7,300 sq. ft. Welcome to Endless Summer, a newly renovated and furnished multi-level home located right across the street from Lake Michigan! Immerse yourself in a true Lake Michigan vacation in this stunning 6 bedroom home, which is designed with large families in mind and sleeps 16 people in beds. This house takes every advantage of its location on the bluff. 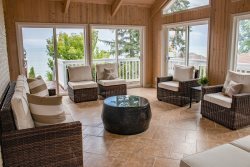 offering vast and uninterrupted views of the pristine Lake Michigan waters. Enormous windows flood the home in natural light to make it appear as though the home extends right out into the waves. Brand new renovations with careful attention to detail have made this home into an amazing vacation spot for those looking for a true Michigan experience. The main floor of the home is positioned for comfortable living and entertaining and where most of your group would spend their family time. The large kitchen has plenty of room for meal preparation and also hosts a small eating area for quick bites. A separate dining room with comfortable seating for eight, gives an intimate space for dinners while still offering full natural light. In the great room, the fireplace offers cozy fireside conversation. A large sofa facing the front windows is a perfect spot to relax to the sounds of the shore. Off the great room the front deck gives opportunity to experience the sights, sounds, and smells of the lake, while the screened in porch offers and more secluded common area without sacrificing the gorgeous views. Upstairs, the master bedroom really shows off this home’s location. Wall to wall windows seem to bring the lake to the foot of the king bed. The master bedroom deck is the perfect place to watch the sunset over the water. A flat screen television and a gas fireplace make the sitting area a cozy place to relax in this room. The en suite full bathroom with a walk in shower and jetted bath complete this master suite. Just down the hall are two queen bedrooms that offer plenty of light and comfort. These bedrooms share a hall bathroom. A few steps up the hall leads to another small family sitting space, perfect for reading and relaxing in peace. There are two queen bedrooms at this end of the hall that offer a surplus of space and partial view of both the lake. The shared jack and jill bathroom offers plenty of space for getting ready with a full shower and bathtub. The lower level of the home is a cool finished basement with a great retro wet bar/ billiards room that is a perfect place for everyone to spend some fun time. There is a hall bathroom adjacent to the bar as well. If you walk north and use the outside door you then cross a breezeway that contains the large 8 - 10 person hot tub. This breezeway also takes you to the separate sixth bedroom, which is a very large family living area that includes a queen bed, two bunk beds, a couch and a 65 inch flat-screen TV. We could rent this space all on it's own but we want the entire family to come visit Endless Summer for a great beach vacation. The beach access is just south of a house, a short one minute walk to the corner of Belle Plaine and Lakeshore. The parking area and guest access to the house is on Ridge Road behind the house, so please make sure that you ask us in advance if you have any questions about parking. There is room for 4 cars but we can always make arrangements for a few extra vehicles.